Ohio University’s Women’s Center strives to be an integral part of the university’s transformative learning community and a national leader in its own right. The Women’s Center promotes inclusion, honors difference, and works with faculty, staff, students, and the larger Athens community, to promote academic achievement, active global citizenship, and substantive leadership positions for women in all professional fields, as well as building confidence within women’s personal lives, by using an intersectional, though gendered, lens. The mission of the Ohio University Women’s Center is to act as a catalyst to promote awareness, education, and advocacy about women, gender, and diversity, among faculty, staff, and students at Ohio University and its surrounding communities. In fulfilling its mission, the Center provides students, faculty, and staff with information, services, and programs that address matters of particular concern to women - while exploring the connections among gender, race, economic status, sexual orientation, culture, religion, political views, and other significant elements in relation to women’s individuality and collective identity. 7PM: Speakers, followed by the march into town. 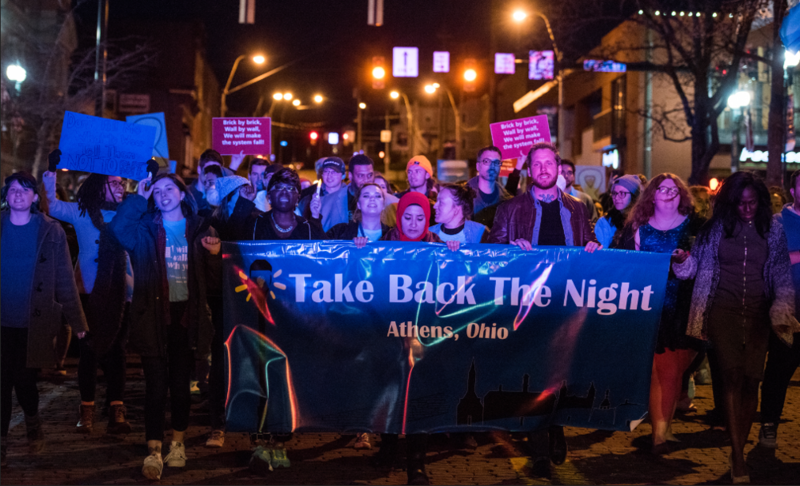 The Take Back the Night march will follow a route with accessible sidewalks. There's an opportunity for everyone to be involved. If you have questions, please contact us.